Hope you’re ready for a healthy dose of Columbus Blue Jackets hockey. Thanks to their schedule before the All-Star break, they face a condensed schedule leading to April and maybe beyond. The Blue Jackets open play Tuesday night at Madison Square Garden against the New York Rangers. Including Tuesday night, the Blue Jackets will play their last 34 games in 69 days. They also have eight sets of back-to-backs to play, including an important set at the beginning of February against the Penguins and Devils. We will try to answer important questions about the team while getting you ready for the rest of the season. We’ll first begin by breaking down their remaining schedule. Starting Feb. 4, the Blue Jackets only have to leave Columbus once in the month. They travel to Detroit on Feb. 7. In that stretch, they play eight of nine at Nationwide Arena. This includes their mandated bye, which lasts from Feb. 20-Feb. 24. Given their success at home this season, that stretch could help strengthen their hold on a playoff spot. They play 16 games in March, including nine on the road. A successful February could make March more manageable. They also will see the Devils, Sabres and Leafs for the first time this season in these last 34 games. Speaking of the Leafs, they host the Blue Jackets on Apr. 9, the last day of the regular season. If things break right, that game could mean something for the playoffs, whether it’s the standings or getting in. Keep that game circled on your calendar. Depending on where the Flyers are at that point, they host the Blue Jackets Apr. 8 in the first of a back-to-back to end the season. Penguins: This is one of the best newer rivalries in the league. Every time the Blue Jackets and Penguins meet, something memorable usually happens. Whether it’s a lopsided score as shown by the Blue Jackets 7-1 win on Dec. 22, or lots of post-whistle activity, something happens. These teams do not like each other. It is must-see TV. They play Feb. 3, Feb. 17 and Apr. 4. Maple Leafs: The two youngest teams in the league clash three times down the stretch, starting on Feb. 15 in Columbus. They also play Mar. 22 and Apr. 9. There is no shortage of skill between these two teams. The Blue Jackets will get their first look at Auston Matthews and Mitch Marner. Red Wings: The Blue Jackets get one more trip to the famed Joe Louis Arena before the Red Wings move to their new home — Little Caesars Arena — starting next season. Players like Michigan-native Zach Werenski will get one last chance to play in a building in which they grew up in. Should be a lot of fun to watch. Capitals: The season series stands 2-1 Blue Jackets in terms of wins, with the Capitals losing one in overtime. The Capitals broke the Blue Jackets’ 16-game winning streak. They play twice down the stretch, Mar. 23 in Washington and Apr. 2 in Columbus. These could help decide who wins the Metropolitan Division. Rangers: These games always have something happen. Earlier in season, the Rangers came back to defeat the Blue Jackets 5-4 on a last second goal. Anytime the Blue Jackets play Rick Nash, there is usually some “Nashtyness” that goes along with it. Teams play Tuesday, then again on both Feb. 13 and Feb. 26. NBCSN will carry the game on Feb. 13. 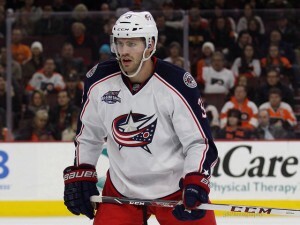 How will the Blue Jackets handle the trade deadline? This is the million dollar question. Who would have thought the Blue Jackets would be this good this season? Instead of finding themselves selling, they’re in the market to buy. But who? Let’s lay the groundwork for this and then explore. What are the biggest needs on this team? In my mind, there are three. Those are backup goaltender, a center who can win faceoffs, and a depth right-handed defenseman. The most immediate need is a capable backup goalie. Ask yourself this question. Can either Joonas Korpisalo or Anton Forsberg step right in if something were to happen to Bobrovsky? Both goalies have talent, but I’m not sure they’re ready for the role. Let me explain. Given where both are at in their development, they need to play. Their best chance to play is in the AHL. While it’s true the team needs to limit Bobrovsky as much as possible for a potential deep run, they need to win games with Bobrovsky taking a night off here and there. The early returns show mixed results. Forsberg played one game in the NHL before returning to Cleveland. Korpisalo came up and did win a game, but was shaky in the Ottawa game. That was game was not all on him, but there were moments he wished he could have back. More importantly though, there’s a confidence issue in place. 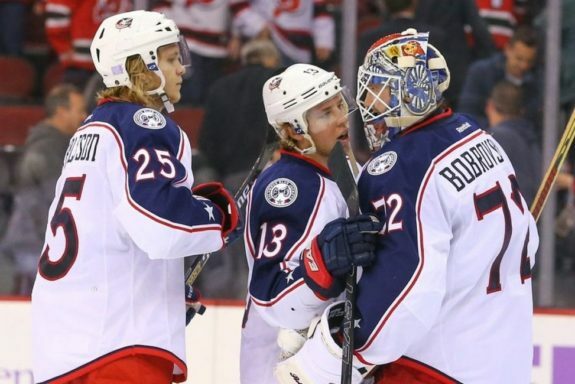 With Bobrovsky in net, the Blue Jackets play a more confident game. They know Bobrovsky will more often than not bail them out. It’s one less worry on their minds. In the games started by Forsberg and Korpisalo, I did not see that confidence. Is the situation decided? Not at all. Korpisalo will likely get a start or two upcoming. My guess would be Saturday night at home against the Devils the night after the Penguins game. Those upcoming starts will sort this out for us. If he plays well, there’s your answer. If not, the Blue Jackets will look for a backup on the market. There’s plenty out there. It shouldn’t cost much either given past trades. This situation has yet to work itself out yet. Performance will dictate the future action. Stay tuned. As for the other things, this market is stagnant at the moment. The standings are too close together. Who’s really a seller? Many buyers and few sellers equals high prices. You’ll likely won’t see much movement in that kind of environment. The first few weeks in February could sort that out for us. You’d think another team or two would start to fall off the pace. We’ll see though. In an age where the loser point reigns supreme, teams are closer than ever. If more teams fall out and become sellers, that could make the prices more affordable. It’s kind of wait and see on the market. And don’t forget about the expansion draft. That makes things different from other years. With all that said, my gut says the Blue Jackets will still look to the future. If they make a move for a forward or a defenseman, it will be for next year and beyond. I don’t expect them to go after many rentals given where they are as a franchise overall. While I don’t expect them to pursue Matt Duchene, I’d give him a better chance than someone like Martin Hanzal. Duchene is not a UFA like Hanzal is. Duchene could also fill a major need as a center who can win faceoffs. Again, don’t expect anything “major.” But do expect the Blue Jackets to look at all avenues to improve their team for the future. Will fatigue be a factor down the stretch? We’re going to see this question a lot with the Blue Jackets. They had a lighter schedule than most early in the season. They now have 34 games in 69 days, with the bye week included. They’re a young team. How concerned should fans be with fatigue? The team won’t use fatigue as an excuse. They had a hard training camp so they could be one of the best conditioned teams out there. We’re going to see how they do with a bunch of games in short order. The ones that I will watch closely are the rookies, such as Werenski and Josh Anderson. They haven’t been through a full NHL schedule in their careers. Weresnki played a total of 67 games last season while helping the then Lake Erie Monsters win the Calder Cup. He played 36 games at Michigan, 24 with Lake Erie, and another seven with Team USA at the World Juniors. He hasn’t missed a game yet for Columbus. At that pace, that’s 82 games with more possible if they make the playoffs. I’m less concerned about Anderson. He played 85 games last season between Columbus and Lake Erie. He’s also on pace to play all 82 games this season for the Blue Jackets. Overall, I’m not too concerned about fatigue. If they make a deep playoff run, then we’ll revisit this question. Still keep your eye on Werenski given his over 20-plus minutes-a-game pace for the season. Should we be concerned about their recent play? You’ll see this question a lot especially if they come out flat Tuesday night at the Garden. The question everyone wants to know is “who are the real Columbus Blue Jackets?” Are they the team who won 16 straight or the one who skidded to the All-Star break? My answer to that is neither. Coach Tortorella is on record as saying he doesn’t know what the Blue Jackets’ identity is. As someone who is there everyday, I’ll give Tortorella’s comment more credence than anything I can come up with. Here’s the point. It’s such a long season. The Blue Jackets have won 32 of their 48 games. They are a good team. Will they keep that pace in the last 34 games? That’s hard to say. They will have bad moments as shown by their play after the winning streak. Bobrovsky wasn’t as sharp. Their defense had some leaks in it. They looked tired. We’ll see how they come out Tuesday. They need to go just 14-16-4 in their last 34 games to reach 100 points. Even if they don’t play their best every night, there is some wiggle room. Don’t be too concerned with the recent slide. If it continues after the break, then raise an eyebrow. Who must play better in these 34 games? I have my eye on one player in particular. That’s Boone Jenner. After scoring 30 goals last season, he has just 16 points in 48 games. What in the world happened here? I expected a regression in his numbers. He got a lot of his production on the power play last season. He doesn’t see near the same amount of time on the power play now, with limited time on the second unit if at all. He went 10 games to start the season without a goal. Some wondered if there was an injury. If he has one, it’s not hampering him. He’s played every game this season. Jenner has had pretty consistent linemates this season in Brandon Dubinsky and Cam Atkinson. Dubinsky has just five goals on the season. Atkinson has a whooping 24 goals on the season. He has played most of the season on the first power play and has thrived. When this trio is out, it’s usually in a defensive role. According to Corsica Hockey, Jenner starts over 36 percent of his shifts in the defensive zone. In contrast, he starts a little more than 29 percent in the offensive zone. These numbers are at 5-on-5. Just to give you a comparison, the Jackets top line of Brandon Saad, Alexander Wennberg and Nick Foligno are each over 36 percent offensive zone starts. Seems Tortorella puts Jenner’s line out in a defensive role against the best of the competition. To his credit, Jenner scored in three straight games from Jan. 13-17 before finishing the last five games before the break with no points. He’s the kind of player that I think would thrive in the playoffs, given his work ethic and tenacity. As these games get harder and tighter checking, I do expect Jenner to improve on his numbers. He’s a career 11.8 percent shooter who is at 8.3 percent now. It’s not out of the question to expect 11 goals in 34 games to get to 20. Considering his lack of power-play time, that’s pretty good. Something that I’m watching is their roster. Remember the Carolina game when the Blue Jackets had to play with seven defensemen? They got caught because they couldn’t get another forward for the game. They have carried eight defensemen all season. Will this continue? Dalton Prout and Scott Harrington each need waivers to go to AHL Cleveland. What if there’s a need for another forward though? Right now it’s fine because the Blue Jackets have 22 on the roster. It’s likely that Markus Hannikainen will rejoin the team as an extra forward. But if illness strikes, then what? They don’t want to have to experience the Carolina game all over again. This might not turn into anything, but it’s something I have in the back of my mind. Other than that, sit back, relax, and enjoy the rest of the season. Can they clinch a playoff spot and their first ever 100-point season? We’ll see.